editor’s note: This article has been published before on this blog. We are re-posting it today as a refresher for anyone who is wallowing in the spring rain and needs to revitalize their gear. The rains have come to Oregon. In the past week the skies have showered us with every type of precipitation from gutter filling downpours to the directionless mist, unique to the Northwest, which seems to be a fixture of winter life in our corner of the world. As practiced inhabitants of this wet wonderland we have learned to shun umbrellas and rely solely on the magical properties of the waterproof jacket (and sometimes pants, and hat, and shoes…you get the idea). Typically this multicolored body armor allows us to traverse gracefully between work and home without worrying about how dry we will be when we arrive at our destination. But, every so often, the magic wears off, the water droplets stop rolling down our jacket and instead the fabric becomes increasingly soggy. For many, this may seem to be the end of their beloved jacket, but never fear! In lots of cases this is simply a sign that your jacket needs to be revitalized. That’s right, you can hold on to your weathered friend for much less than the price of a new jacket. In fact, your jacket hasn’t stopped being waterproof at all, it has only lost the first protective layer against the elements. Let me explain, what makes a jacket “waterproof”is a porous waterproof-breathable membrane on the inside of the jacket. It’s that white or sometimes gray layer that often has a slightly plasticky feel. This membrane has holes so small that water droplets seeking to penetrate the jacket from the outside are not able to pass through. Conversely, the holes are still big enough to allow much smaller moisture vapor to escape from the inside of the jacket when you start to heat up. This is what we mean when we say a jacket is breathable. This system works extremely well as long as these microscopic holes stay clear, but in conditions like heavy downpours or prolonged exposure to rain, water droplets clinging to the outside of the jacket will start to block these holes, this is a process known as “wetting out”. No holes means no breathability, no breathability means moisture vapor turns into condensation, and now even though you are free from the moisture on the outside you have created a rainforest inside your jacket and you still get wet. You have most likely seen this happen to a jacket or two. 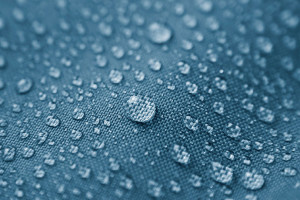 When you first get your new jacket from the store you will notice that any water that touches the surface collects in little beads and simply slides right off your jacket. 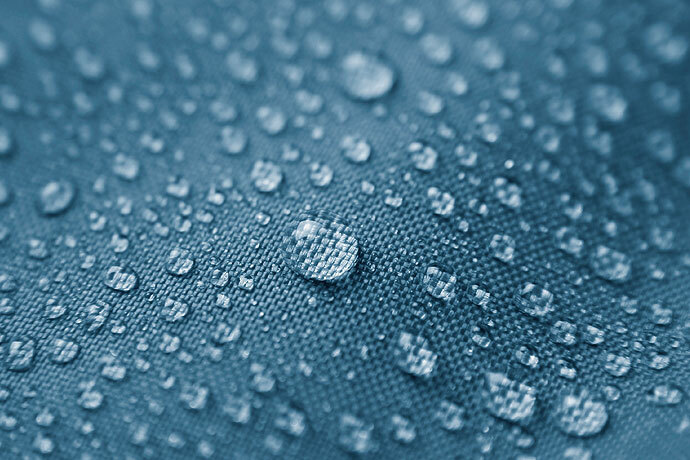 Over time and with consistent wear, you will notice that water stops beading up and instead starts to saturate the face fabric on your jacket, like it would with a paper towel. INSPECT: Look over your waterproof garment and inspect for tears or excessive wear especially on the white/gray coating on the inside of the jacket which may indicate a failure of the waterproof-breathable membrane. If your garment is free of any such failures you will likely be able to revive its health with a new coat of DWR. CLEAN:Before applying the DWR you should thoroughly clean your garment with water and an appropriate cleaning agent such as Nikwax’s Tech Wash. Without washing, dirt and grime buildup on your garment can prevent the DWR coating from correctly bonding with your garment. APPLY: Select your preferred DWR applicant, we recommend TX. Direct made by Nikwax. This awesome product can be applied through hand-washing, spraying it on using the provided applicator or by simply throwing it in the washing machine. How cool is that! DRY: Drying your garment will allow for maximum longevity for your DWR treatment, it also helps evenly distribute the DWR throughout the garment. In some cases, using a dryer can lead to damage, please follow manufacturers recommendations for washing and drying your garments to avoid unnecessary damage. ENJOY: The magic is back! Now you can hit the trail without fear of liquid getting in your layers. We hope this how-to has been a helpful introduction into the world of waterproofing and that you are now equipped with the necessary knowledge to keep your gear lasting longer. As always, if you have any questions or simply want to chat about your next adventure, come visit us at the shop! Copyright © 2014 Salem Summit Co.